Minnesota Congresswoman Michele Bachmann is getting left in the dust when it comes to her presidential run. Numerous GOP candidates have pulled far ahead of her, and the money is rapidly dwindling. To shore up some final support, she’s reaching to the most loyal of her base — the conservative Christians. There’s only one small problem with the legislation as proposed: It’s totally unconstitutional. 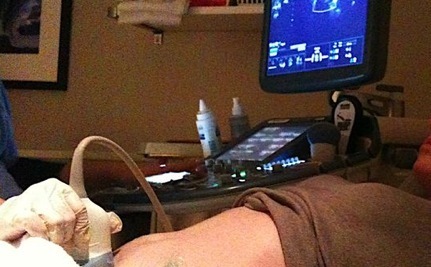 Texas Governor Rick Perry proposed the same mandatory ultrasound bill in his state, making it part of a slate of “emergency” legislation he demanded the legislature pass immediately. The bill was passed, then promptly challenged. Federal Judge Sam Sparks allowed the mandatory ultrasound itself to be left as an abortion restriction, but blocked the part of the law stating that every woman has to listen to the doctor explain fetal development and hear the fetus’s heartbeat, calling it a violation of freedom of speech to force doctors to provide the details and to force women to listen. The Supreme Court agreed, refusing to hear the case when state lawmakers tried to kick the ruling up to the higher court for appeal. As MPR notes, Congresswoman Bachmann hasn’t managed to make it to one House vote since August. But now she has time to propose a bill she knows cannot become law even if it does pass, just to try and shore up political support? I guess she really is campaigning hard for president. I don't know how anyone can be against abortion if they just read some of the whacko comments on here. Too bad it can't be retroactive. I am so sick of people TELLING me that they are Christians. If they really are, it will show in their lives. It's a lot like waving the flag to prove patriotism. Emanuel, so all I have to do to protect myself from chemicals in food, medicine and the environment is be against abortion?? I don't know what is beating behind Bachmann's breastbone. It sure isn't a heart...she doesn't have one. She has an automated recorder in there that spouts the same old religious wacko nonesense, and cares nothing about the people in this Country who are not wealthy and are hurting. Do we have any real options for a president who supports real liberal values and is anti war? I don't know what is beating behind Bachmann's breastbone...it sure isn't a heart. She doesn't have one...she has an automated recorder that repeats the same old whaco religious nonsense. And her favorite montra "Barack Obama is a one term president" ...boy is she in for a big surprise. It is really unnerving right now, Robyn, to see how many of that kind of political candidate we have right now. And so many states keep trying to pass various laws restricting abortion (even knowing in advance that they'll be struck down on appeal). Since we aren't allowed Constitutionally to have any religious test for public office (and shouldn't have any such test), anyone is allowed to be elected if they can garner the votes, even those whose extreme fundamentalist religious views frighten many civil libertarians. But the more moderate among us should definitely hope that the extremists don't get elected! All these religious nutjobs. Would we all be forced into joining a specific branch of Xianity if one of them were elected president? Or would we have to switch to aother branch every month or week or year to make them all happy? The Constitution doesn't really say "separation of church and state", it just declares that no particular religion should be made the state religion of the US. We need more protection against the little safety that that supplies. It would be far too dangerous to elect any religious fanatic of any persuasion. The government is already punishing those who believe in cooperation, and not competition. Ah ha! I just thought that we do have a state religion: Greed !! Women have and always should have the right to decide for themselves whether or not to keep or terminate a pregnancy.